Astronomers have released a new image of the outer atmosphere of Betelgeuse – one of the nearest red supergiants to Earth – revealing the detailed structure of the matter being thrown off the star. The new image, taken by the e-MERLIN radio telescope array operated from the Jodrell Bank Observatory in Cheshire, also shows regions of surprisingly hot gas in the star’s outer atmosphere and a cooler arc of gas weighing almost as much as the Earth. The scientists publish their results in a paper in the Oxford University Press journal Monthly Notices of the Royal Astronomical Society. Betelgeuse is easily visible to the unaided eye as the bright, red star on the top left shoulder of Orion the Hunter. The star itself is huge – 1,000 times larger than our Sun – but at a distance of about 650 light years it still appears as a tiny dot in the sky, so special techniques combining telescopes in arrays are required to see details of the star and the region around it. The new e-MERLIN image of Betelgeuse shows its atmosphere extends out to five times the size of the visual surface of the star. It reveals two hot spots within the outer atmosphere and a faint arc of cool gas even farther out beyond the radio surface of the star. An international team of astronomers observed 20 nearby galaxies, some of which were known to be undergoing a starburst. They found that the winds accompanying these star formation processes were capable of ionising gas up to 650 000 light-years from the galactic centre — around twenty times further out than the visible size of the galaxy. This is the first direct observational evidence of local starbursts impacting the bulk of the gas around their host galaxy, and has important consequences for how that galaxy continues to evolve and form stars. Staring at a small patch of sky for more than 50 hours with the ultra-sensitive Karl G. Jansky Very Large Array (VLA), astronomers have for the first time identified discrete sources that account for nearly all the radio waves coming from distant galaxies. They found that about 63 percent of the background radio emission comes from galaxies with gorging black holes at their cores and the remaining 37 percent comes from galaxies that are rapidly forming stars. 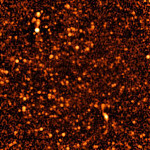 “The sensitivity and resolution of the VLA, following its decade-long upgrade, made it possible to identify the specific objects responsible for nearly all of the radio background emission coming from beyond our own Milky Way Galaxy,” said Jim Condon, of the National Radio Astronomy Observatory (NRAO). “Before we had this capability, we could not detect the numerous faint sources that produce much of the background emission,” he added. Previous studies had measured the amount of radio emission coming from the distant Universe, but had not been capable of attributing all the radio waves to specific objects. In earlier observations, emission from two or more faint objects often was blurred or blended into what appeared to be a single, stronger source of radio waves. Antimatter is strange stuff. It has the opposite electrical charge to matter and, when it meets its matter counterpart, the two annihilate in a flash of light. Four University of California, Berkeley, physicists are now asking whether matter and antimatter are affected differently by gravity as well. Could antimatter fall upward – that is, exhibit anti-gravity – or fall downward at a different rate? In a new paper published online on April 30 in Nature Communications, the UC Berkeley physicists and their colleagues with the ALPHA experiment at CERN, the European Organization for Nuclear Research in Geneva, Switzerland, report the first direct measurement of gravity’s effect on antimatter, specifically antihydrogen in free fall. Though far from definitive – the uncertainty is about 100 times the expected measurement – the UC Berkeley experiment points the way toward a definitive answer to the fundamental question of whether matter falls up or down. Scientists have used Chandra to make a detailed study of an enormous cloud of hot gas enveloping two large, colliding galaxies. This unusually large reservoir of gas contains as much mass as 10 billion Suns, spans about 300,000 light years, and radiates at a temperature of more than 7 million degrees Kelvin. Because it has no source of energy, a dead star — known as a white dwarf — will eventually cool down and fade away. But circumstantial evidence suggests that white dwarfs can still support habitable planets, says Prof. Dan Maoz of Tel Aviv University’s School of Physics and Astronomy. Now Prof. Maoz and Prof. Avi Loeb, Director of Harvard University’s Institute for Theory and Computation and a Sackler Professor by Special Appointment at TAU, have shown that, using advanced technology to become available within the next decade, it should be possible to detect biomarkers surrounding these planets — including oxygen and methane — that indicate the presence of life. Published in the Monthly Notices of the Royal Astronomical Society, the researchers’ “simulated spectrum” demonstrates that the James Webb Space Telescope (JWST), set to be launched by NASA in 2018, will be capable of detecting oxygen and water in the atmosphere of an Earth-like planet orbiting a white dwarf after only a few hours of observation time — much more easily than for an Earth-like planet orbiting a sun-like star.